Most people don’t think about trash after it’s left the curb. Those who do wonder about where there trash goes, assume it heads directly to a landfill where it is buried and forgotten. But LCSWMA understands that solid waste management decisions have a lasting impact on the environment for many generations. That’s why we work hard to transform waste into a resource to make great things happen in our community. Rethinking Waste for a Sustainable Future. The first word of LCSWMA’s tagline (RETHINK) conveys our commitment to discovering and implementing new ways of using waste as a resource to create a sustainable future. LCSWMA also envisions a future where society uses waste in ways that improve the livability of our community. Managing Waste as a Resource to Protect and Benefit Our Community. The second word of LCSWMA’s tagline (RECOVER) conveys our commitment to creating value from waste, in order to benefit our community. Of equal importance, LCSWMA manages the waste while protecting the safety, health, and welfare of the people we serve and the surrounding environment. 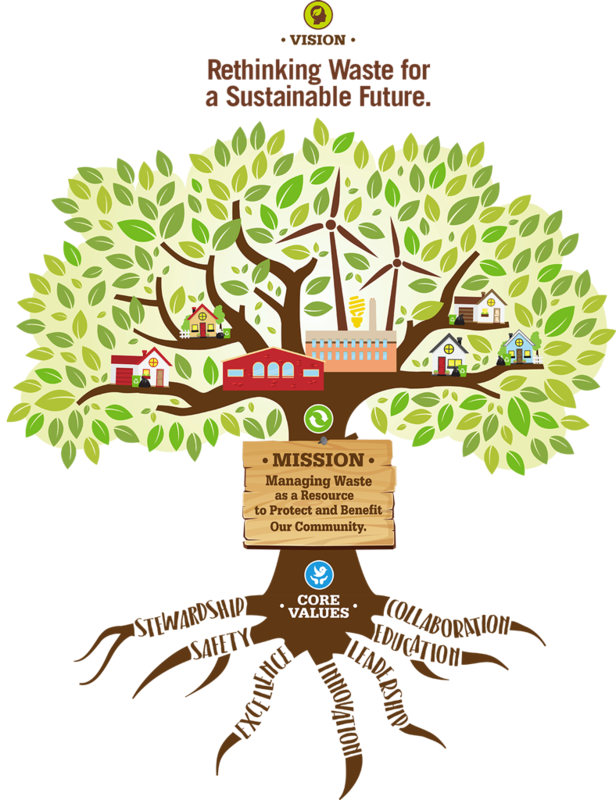 The third word of LCSWMA’s tagline (RENEW) speaks to our value system, whereby the strong roots of the organization represent the foundation of our vision and mission, to create new opportunities from society’s waste. Stewardship: managing our resources to protect the environment. Safety: protecting the wellbeing of our employees, customers, and community. Excellence: delivering the highest quality in all we do. Innovation: rethinking our initiatives, operations, and assets to create opportunities. Leadership: guiding our organization, industry, and community with passion and vision. Education: communicating information to help society rethink waste. Collaboration: working together to achieve success. The history of LCSWMA began in 1954 when the city of Lancaster and surrounding municipalities formed the Lancaster Area Refuse Authority, better known as LARA. In 1986, after several years of planning for the best way to manage the community’s solid waste while preserving farmland, LARA became the Lancaster County Solid Waste Management Authority (LCSWMA) and the Integrated System was established. Over the last several decades, LCSWMA has grown tremendously. Now a regional authority, LCSWMA manages over 1 million tons of solid waste each year from Lancaster and Dauphin Counties, with a focus on diversified business opportunities, green operations practices and long-term community sustainability.